Why did my file open read-only? Some antivirus programs may protect you from potentially unsafe files by opening them read-only. You may need to check with your antivirus provider to learn how to adjust these settings. BitDefender, for example, has content on adding application exclusions here: How to add application or process exclusions in Bitdefender Control Center. Are the file properties set to read-only? You can check the file properties by right-clicking on the file and choosing Properties. If the Read-only attribute is checked, you can uncheck it and click OK. Files from the Internet and from other potentially unsafe locations can contain viruses, worms, or other kinds of malware that can harm your computer. This is also commonly the case with email attachments or files you've downloaded. To help protect your computer, files from these potentially unsafe locations are opened in Protected View. By using Protected View, you can read a file and see its contents while reducing the risks. For more information on Protected view and how to change settings, see this article: What is Protected View? If the file is stored on OneDrive and your OneDrive storage space is full, you will be unable to save the document until you are under your allotted space. You can check your free space on OneDrive by clicking the OneDrive icon in the notification center and choosing Manage storage, or you can go to http://onedrive.live.com, sign in, and note the amount of used space in the lower left of the screen. 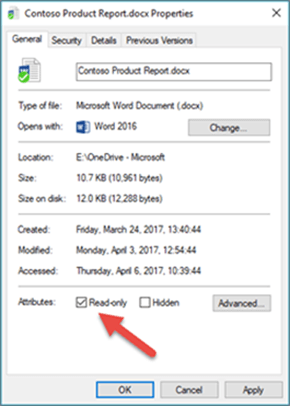 If Office is not activated, or if your subscription has expired, you could be in read-only Reduced Functionality Mode. For information on how to Activate Office, see: Unlicensed Product and activation errors in Office. Our experts and community members are discussing this topic in our Answers forums! Click that link to head over there, see what they're saying, and participate in the conversation if you like. This article was last reviewed by Ben on June 21st, 2018 as a result of your comments. If you found this article helpful, and especially if you didn't, please use the feedback controls below to let us know how we can make it better.